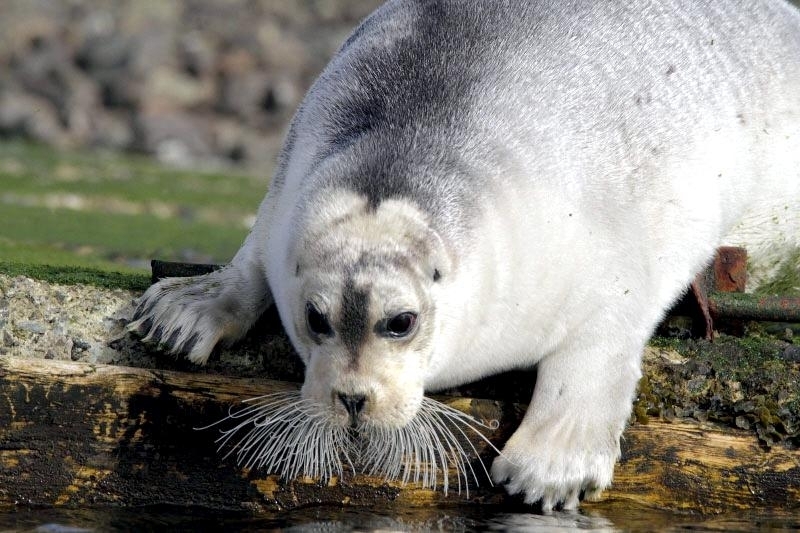 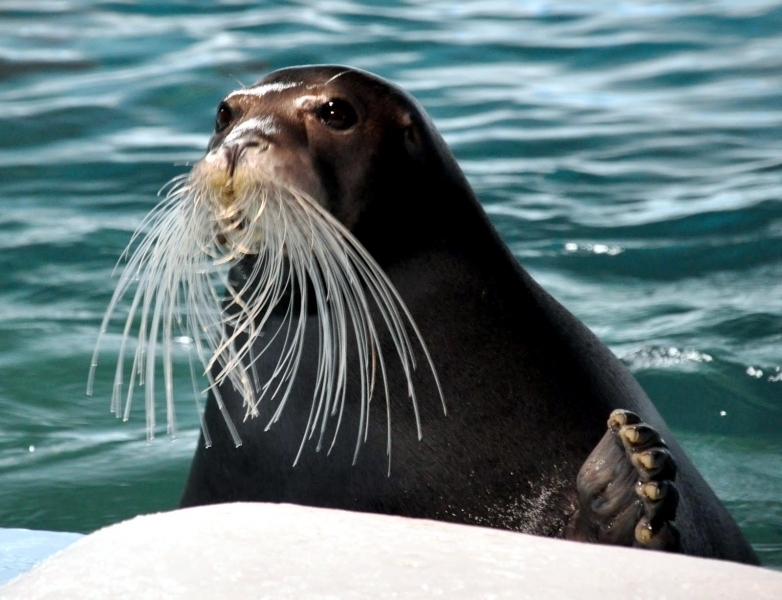 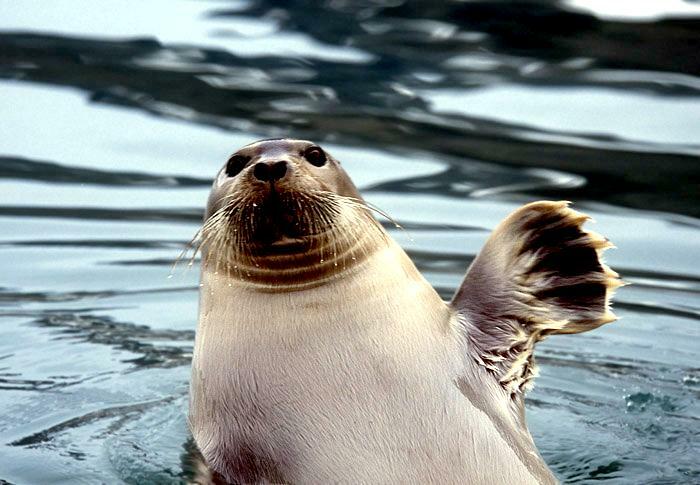 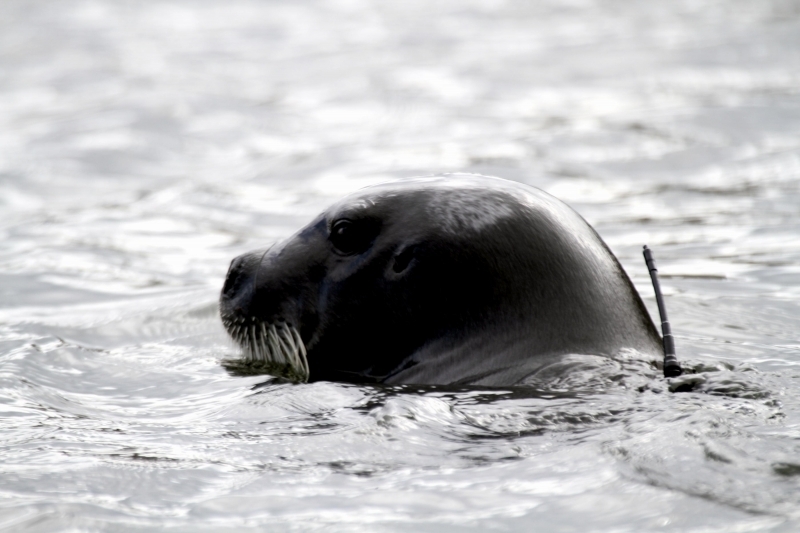 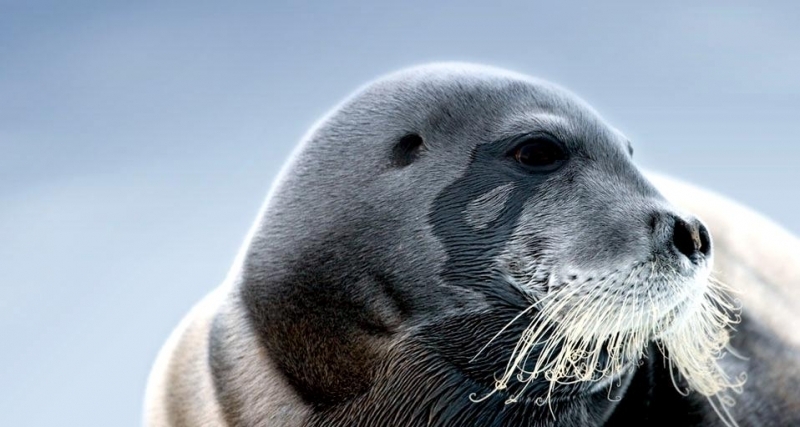 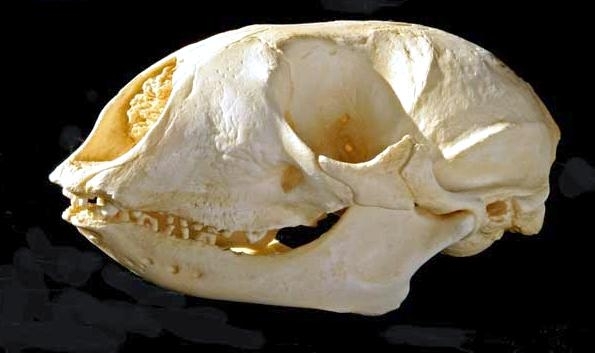 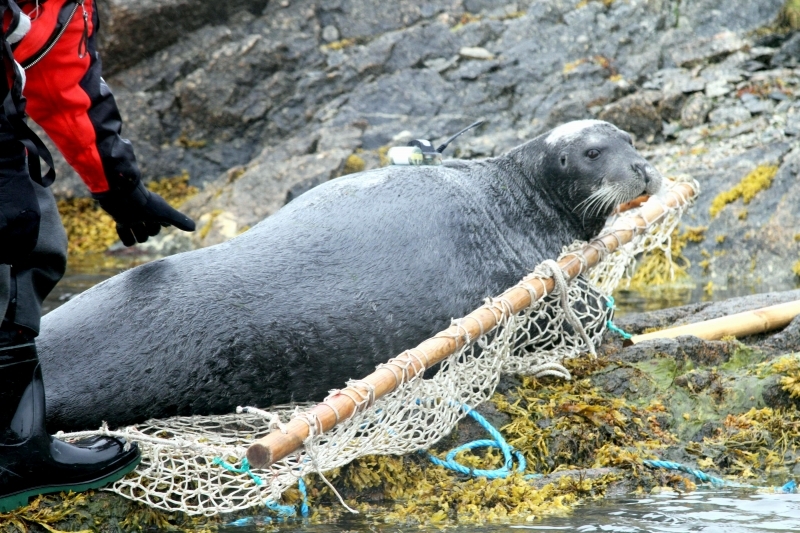 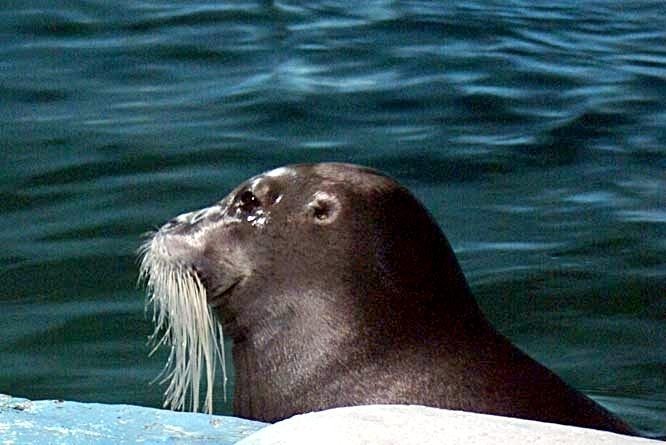 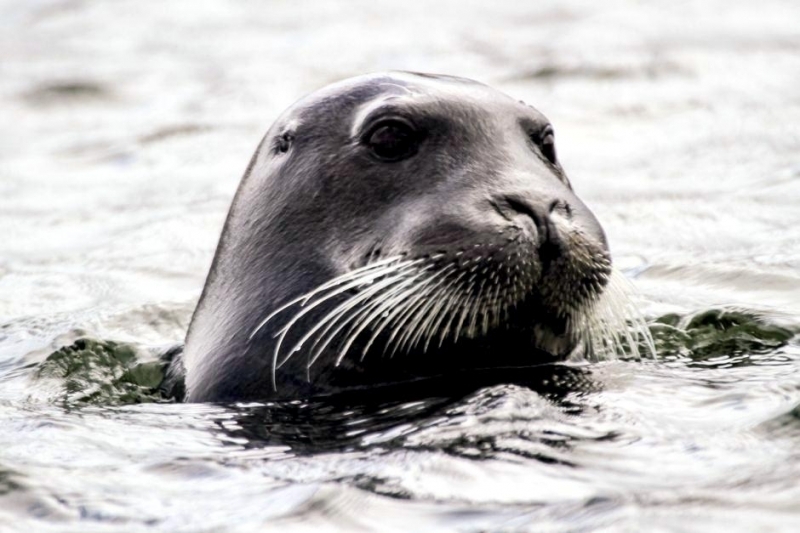 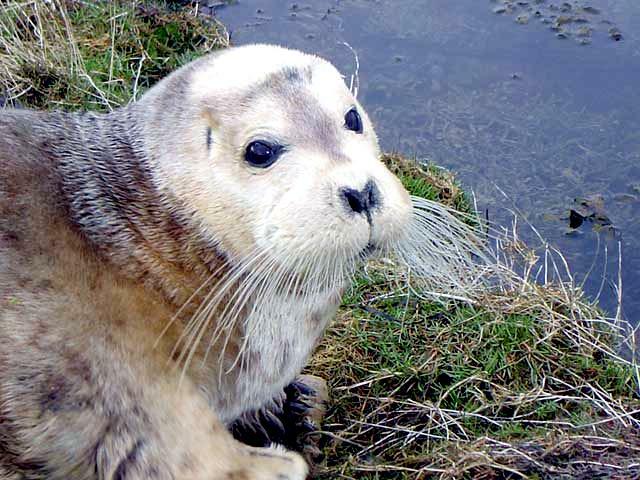 Bearded Seals named for their long whiskers, reach 2.1-2.4 meters in length and weigh between 200-250 kilograms. 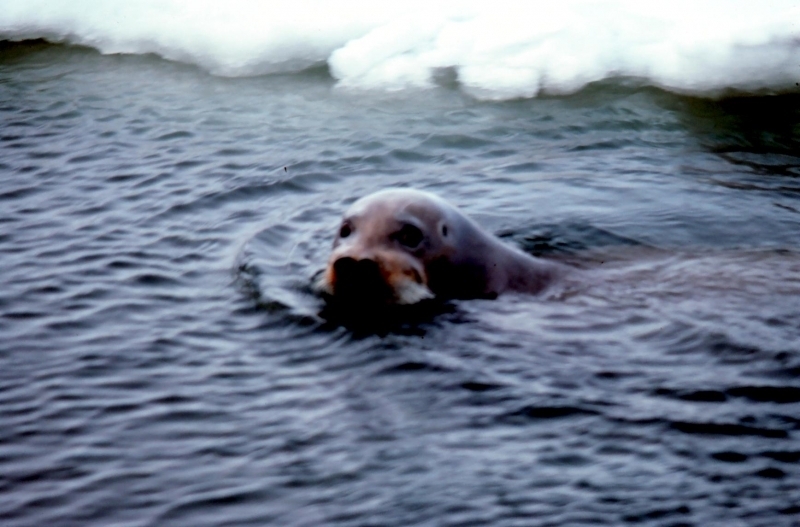 In some regions, the females appear to be slightly larger than the males. 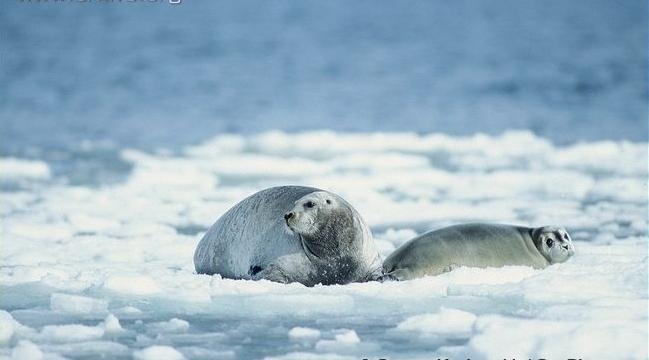 Their coats are solid gray to brown. 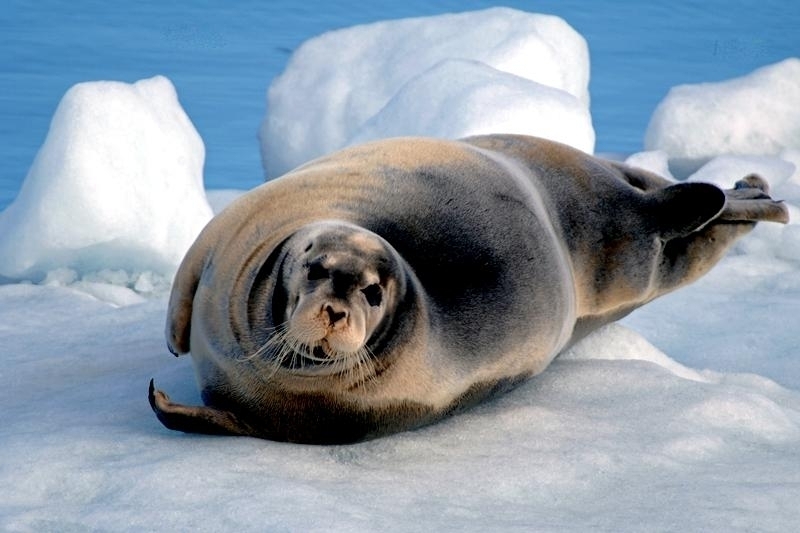 These seals have a noticeably small head in relation to their large bodies. 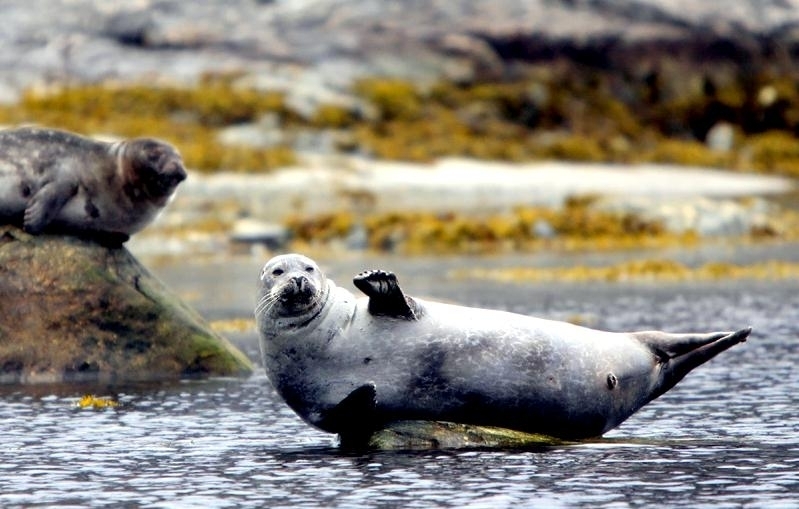 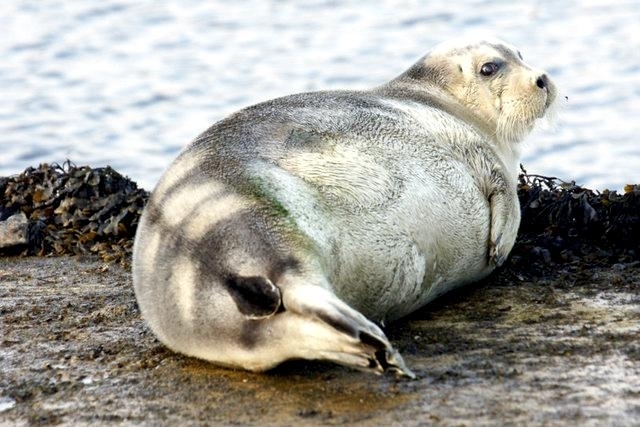 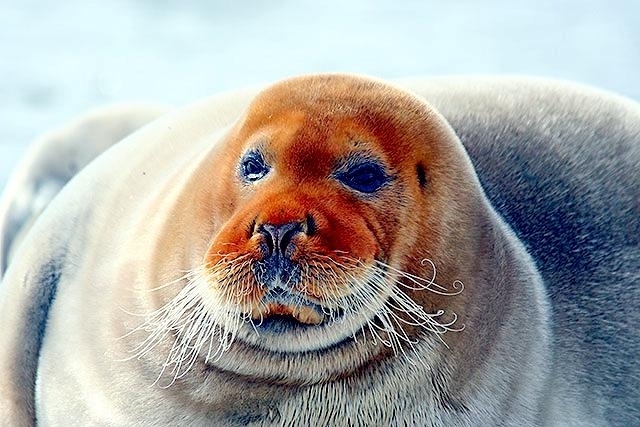 The Bearded Seal’s diet consists primarily of shrimps, crabs, clams, whelks and some fish such as sculpin, flatfish and cod. 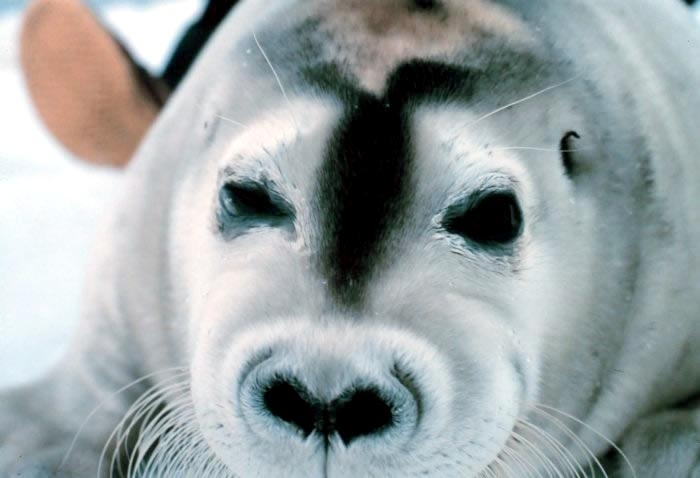 They feed in water depths of less than 130 meters. 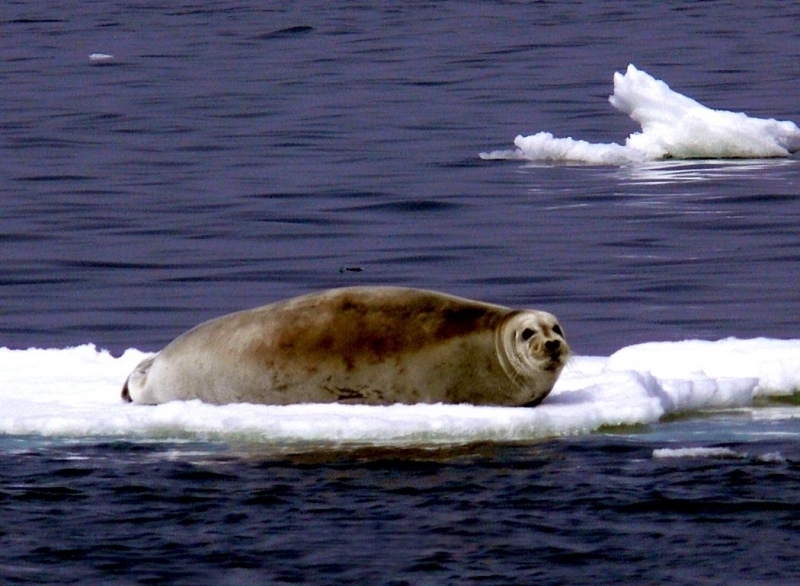 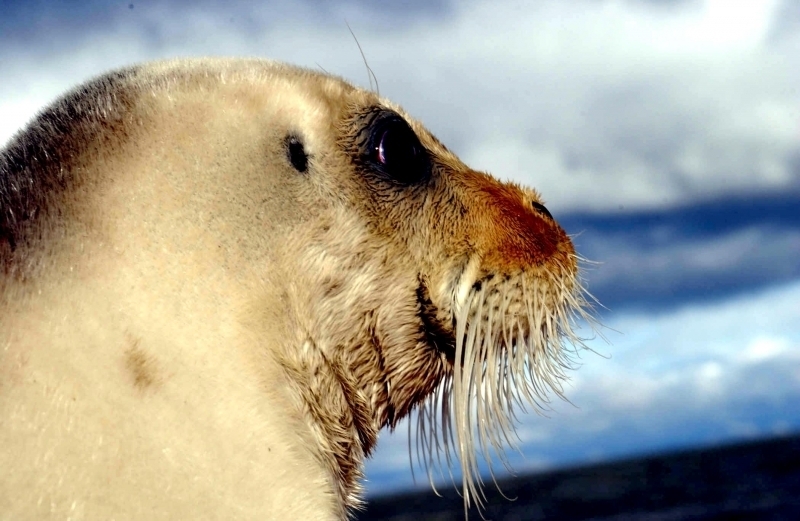 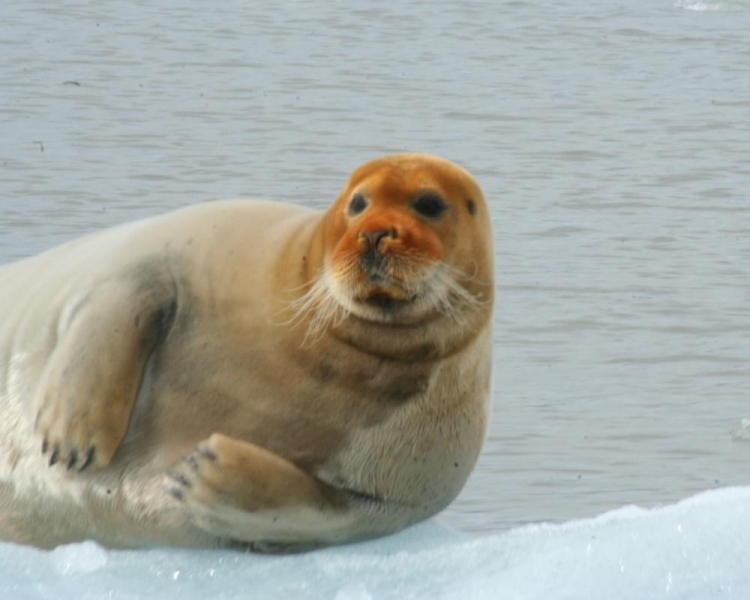 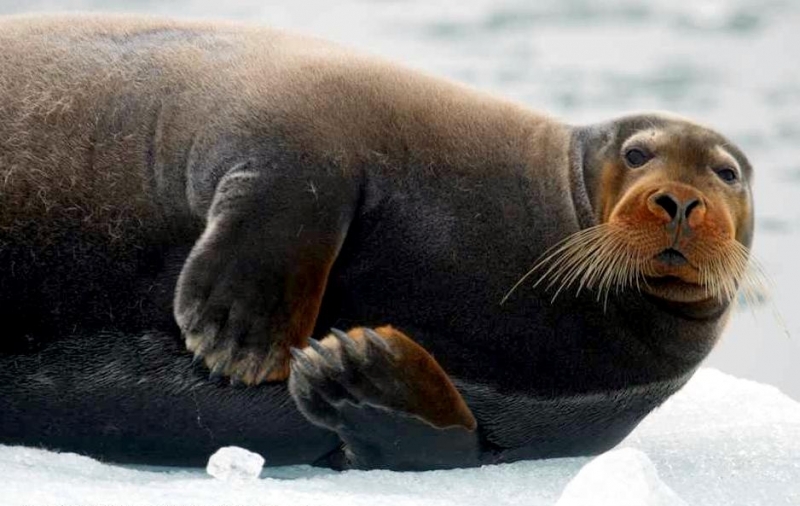 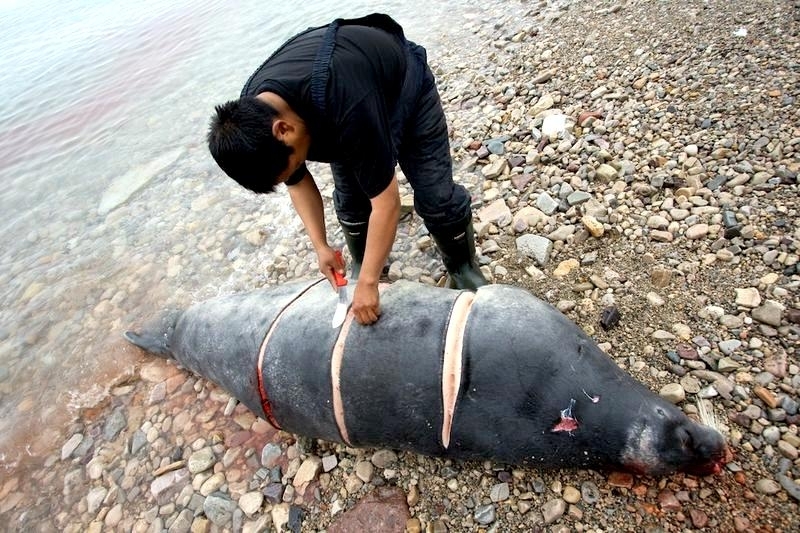 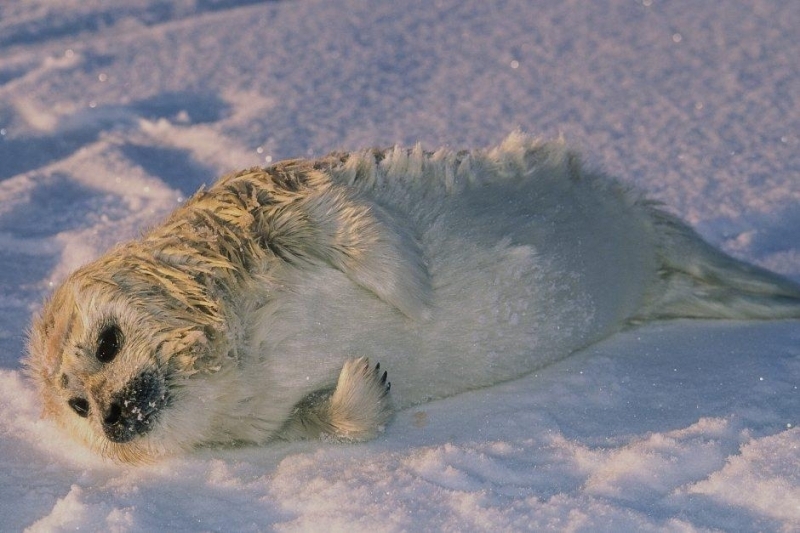 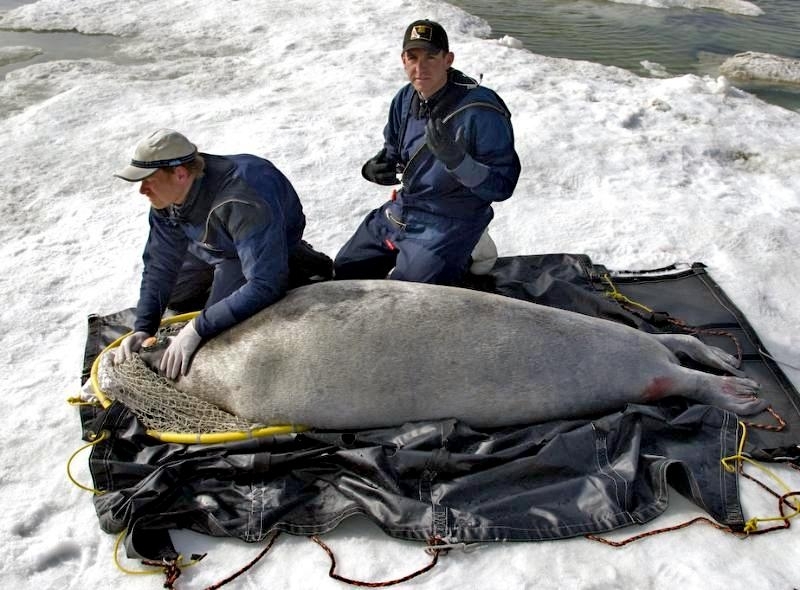 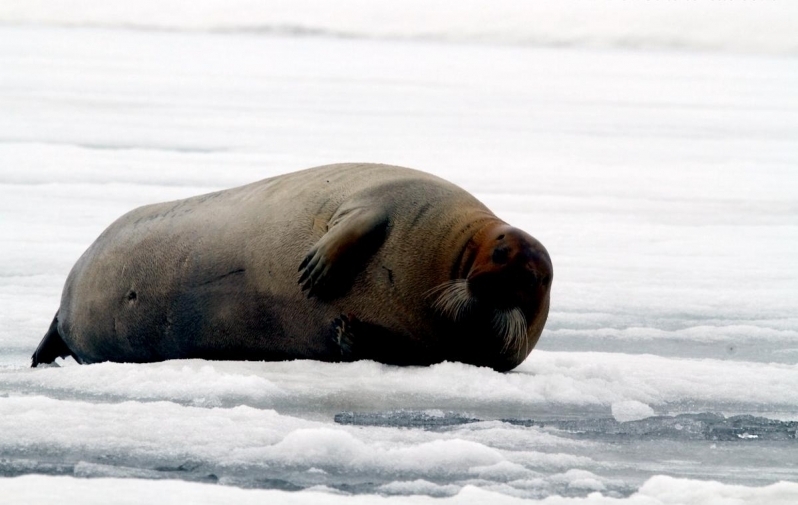 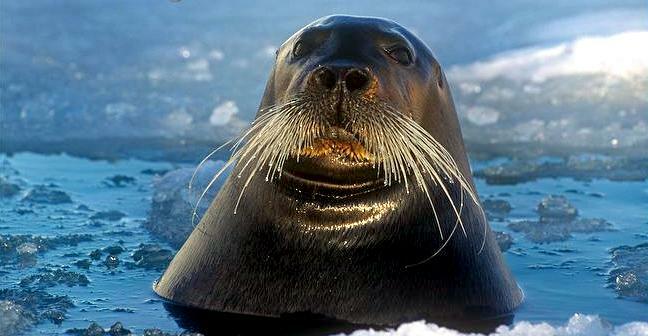 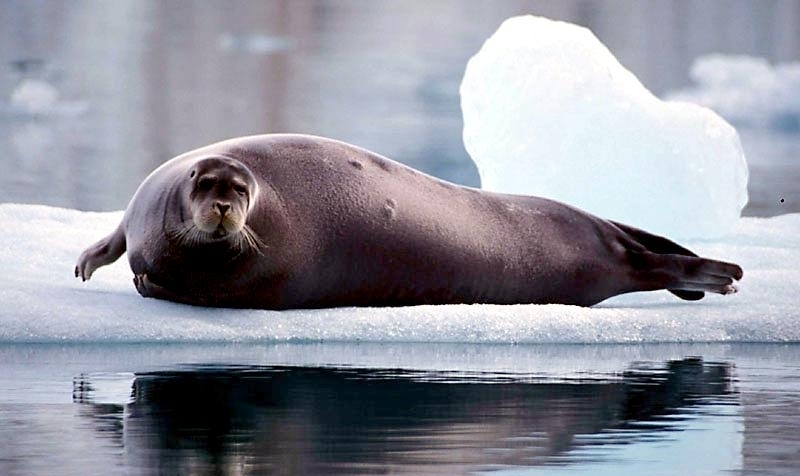 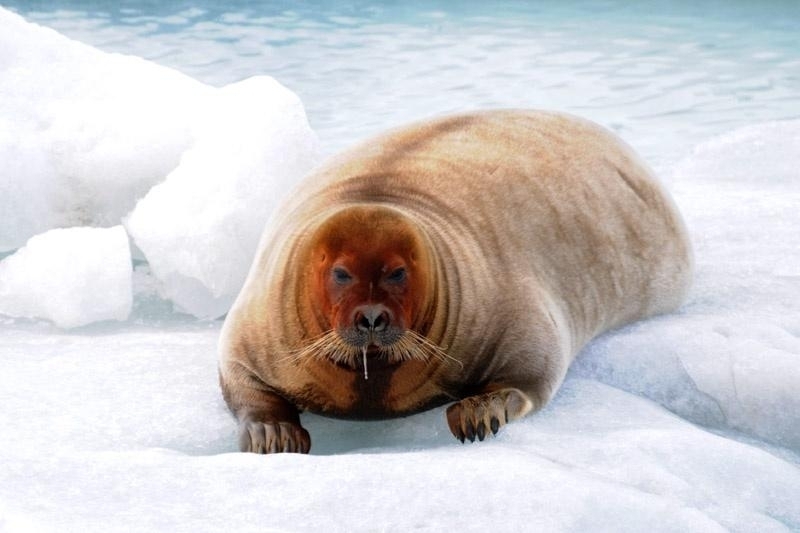 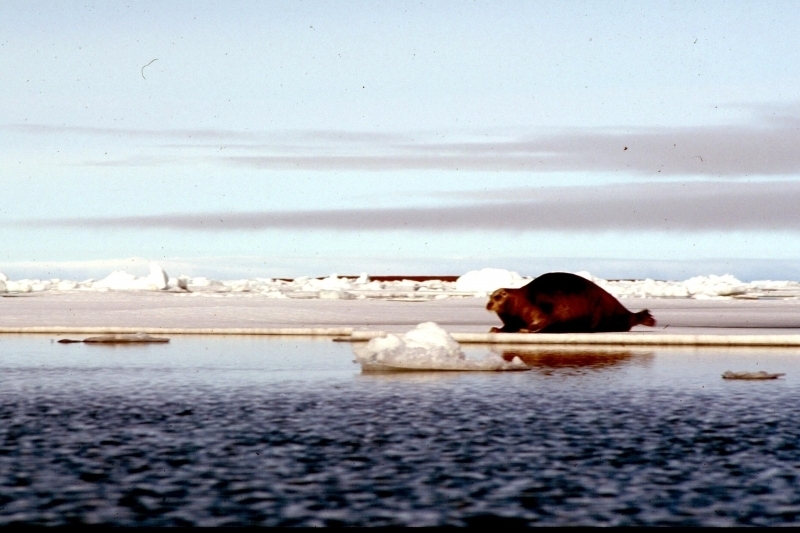 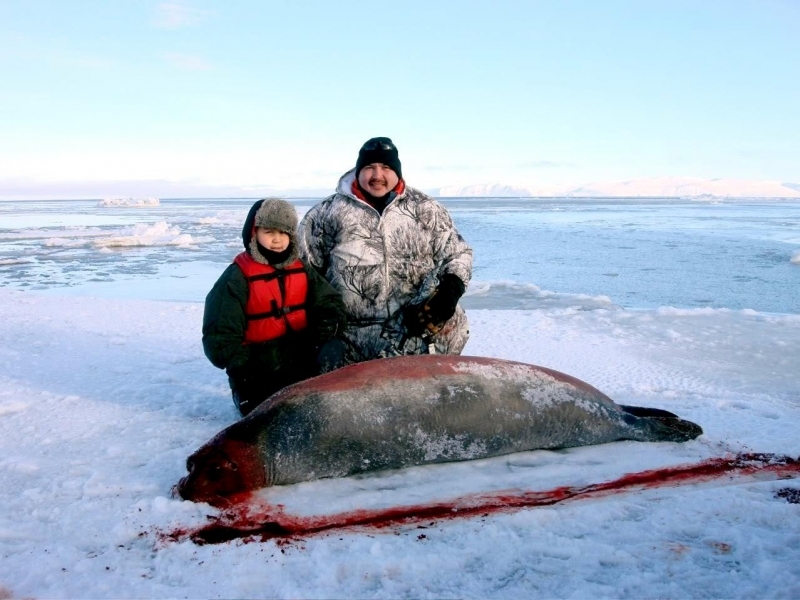 They are preyed upon by Polar Bears & Killer Whales and on occasion, Walruses are known to take Bearded Seal pups. 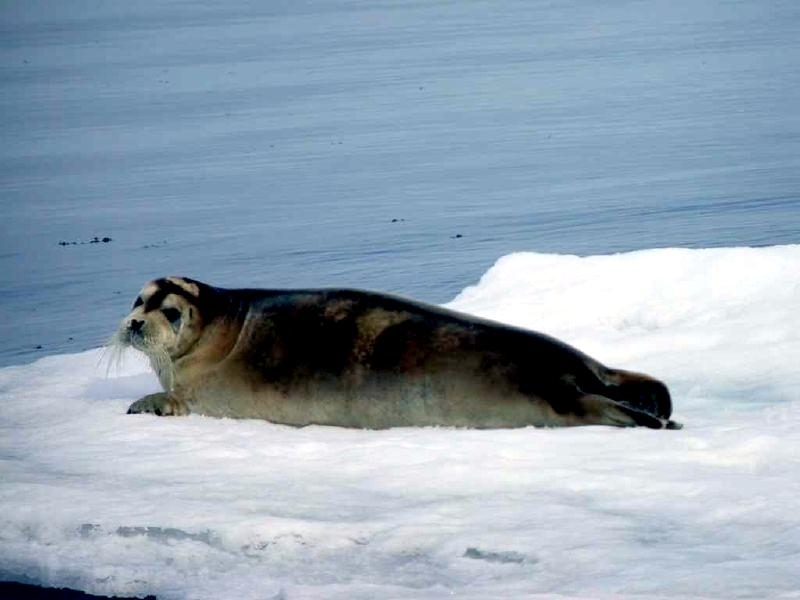 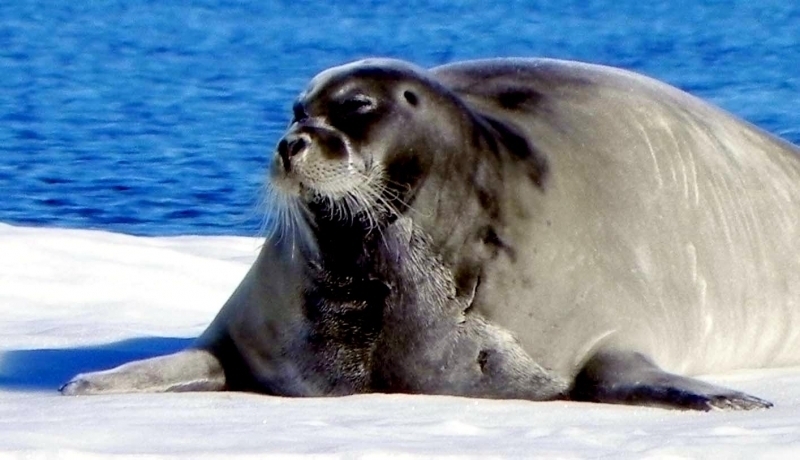 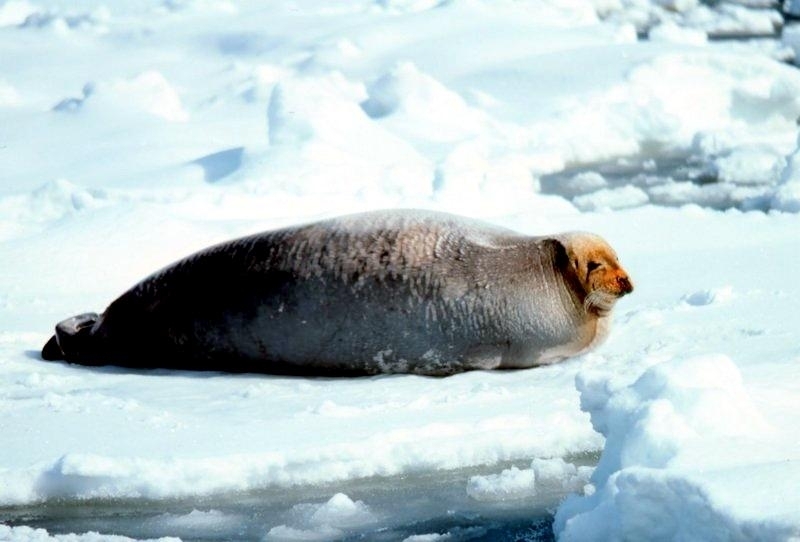 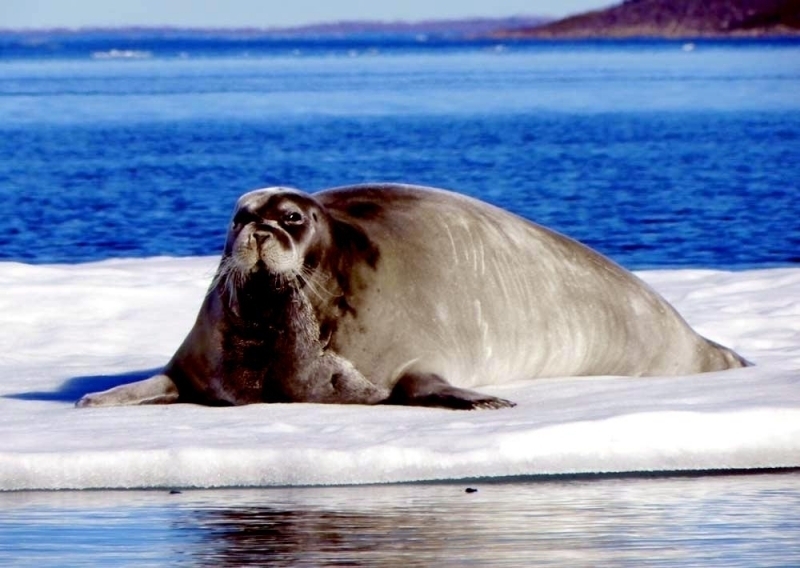 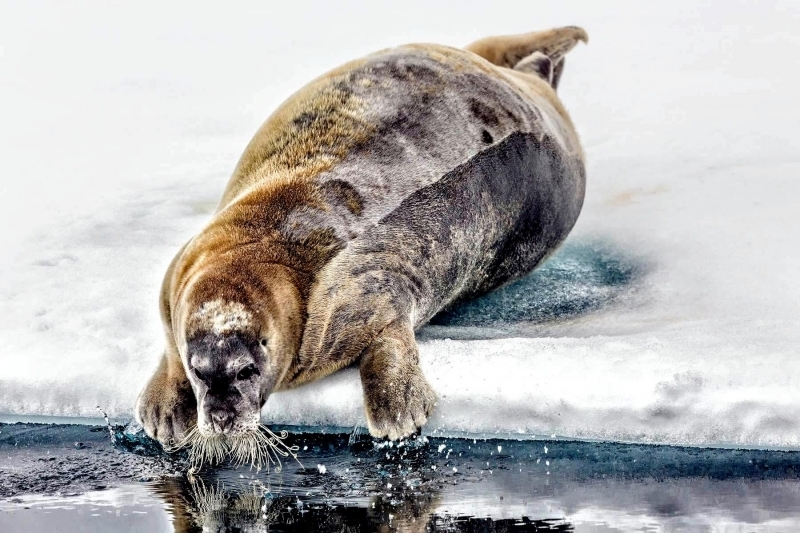 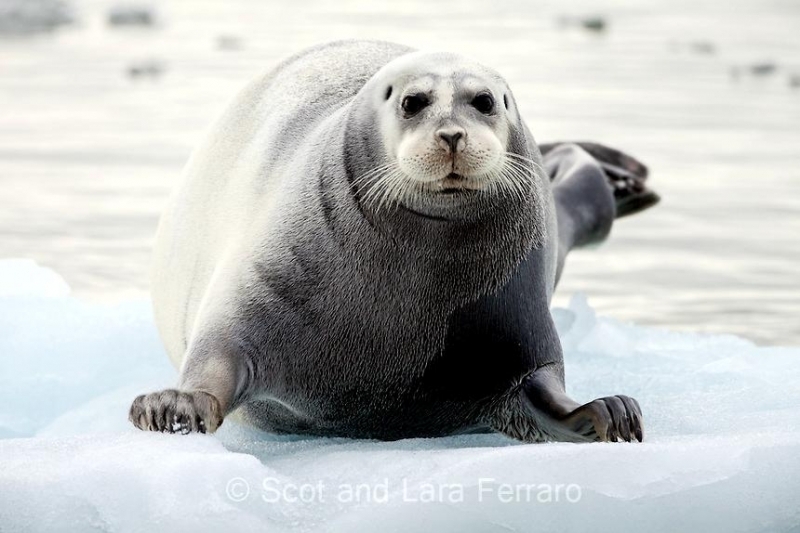 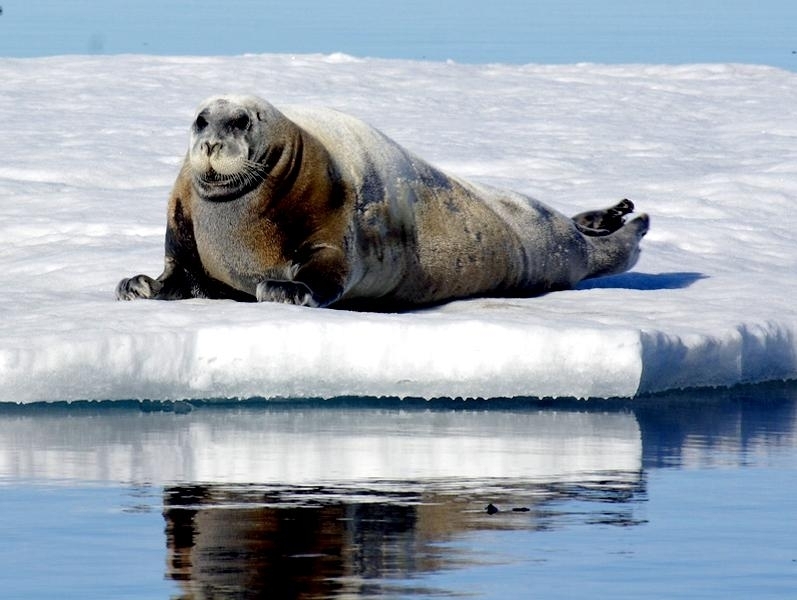 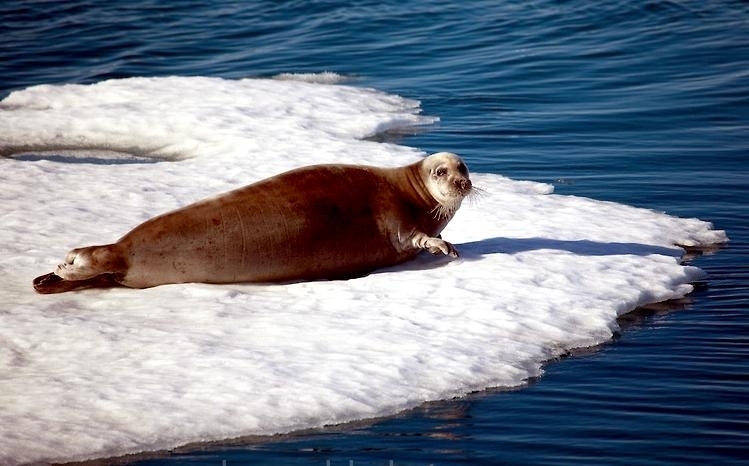 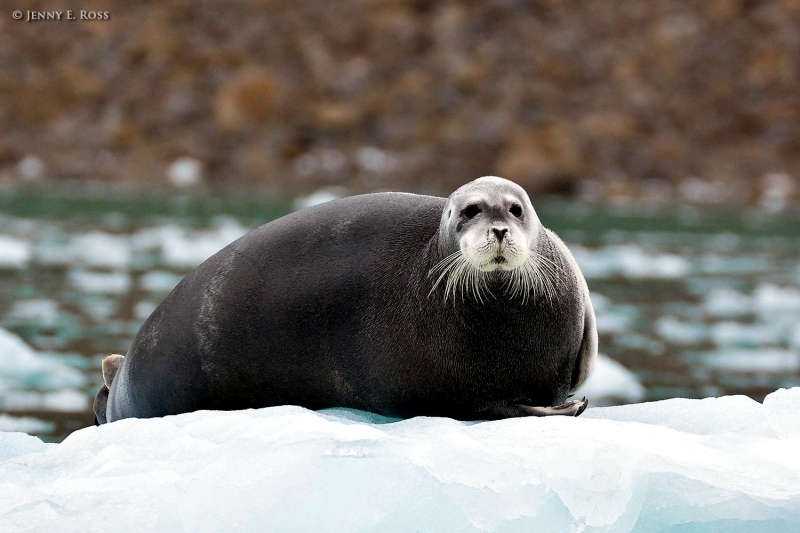 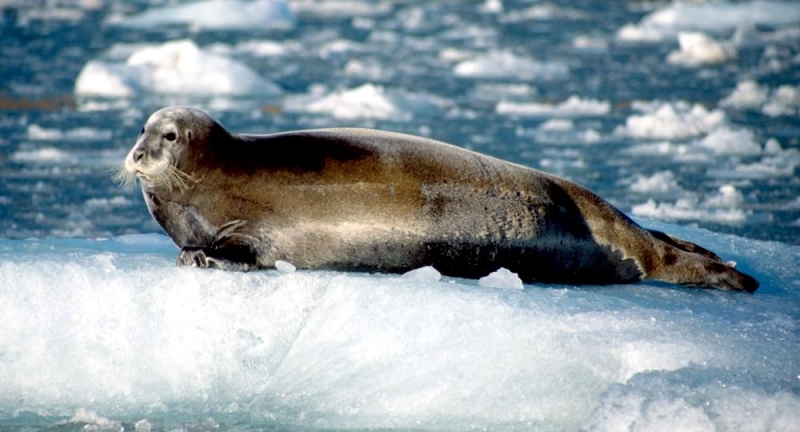 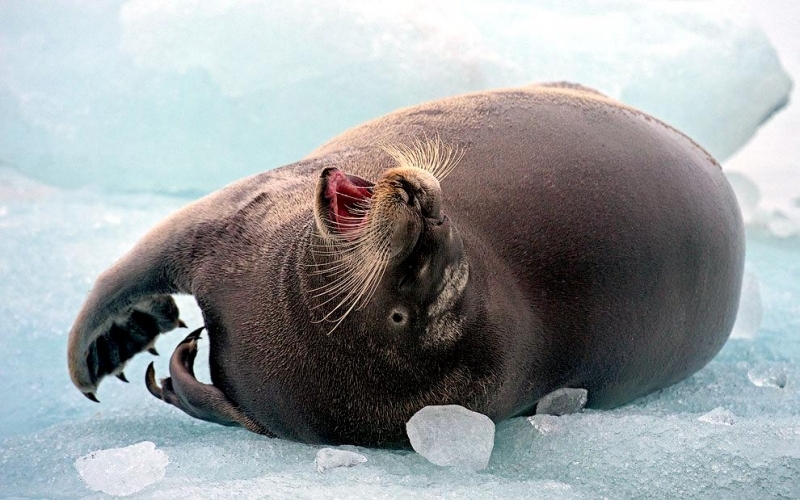 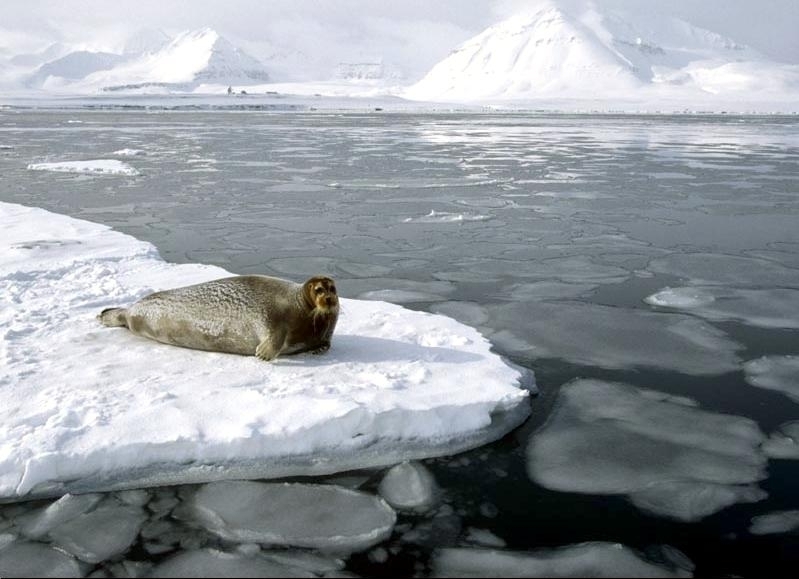 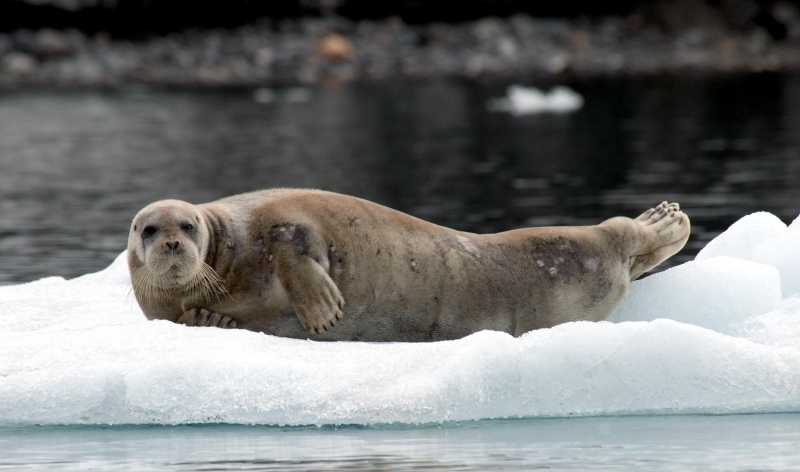 Bearded Seals prefer areas of broken pack ice and drifting ice floes, but they are also found on shore-fast and thick ice where they are able to maintain breathing holes. 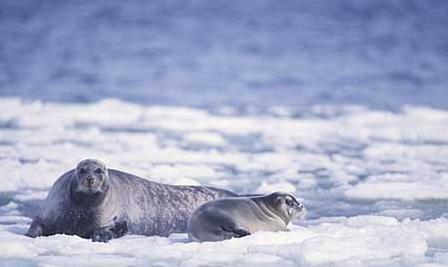 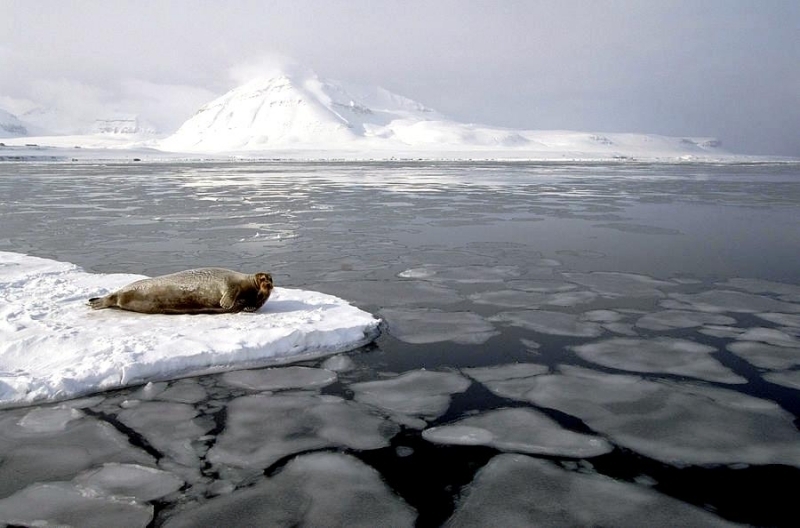 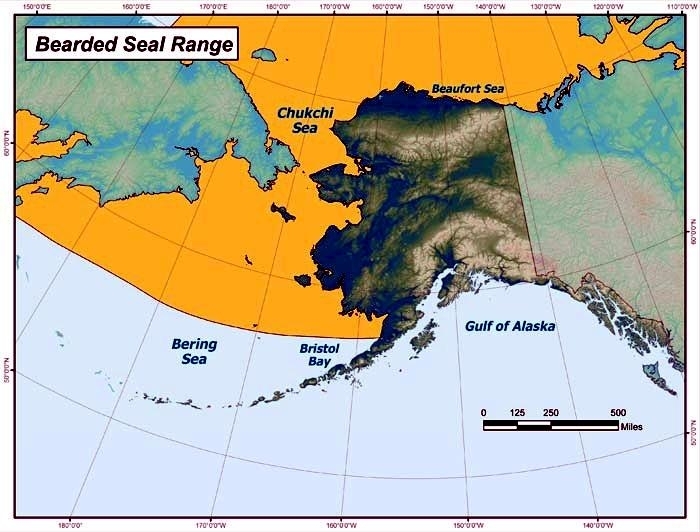 These seals migrate seasonally, moving north with the receding ice in summer. 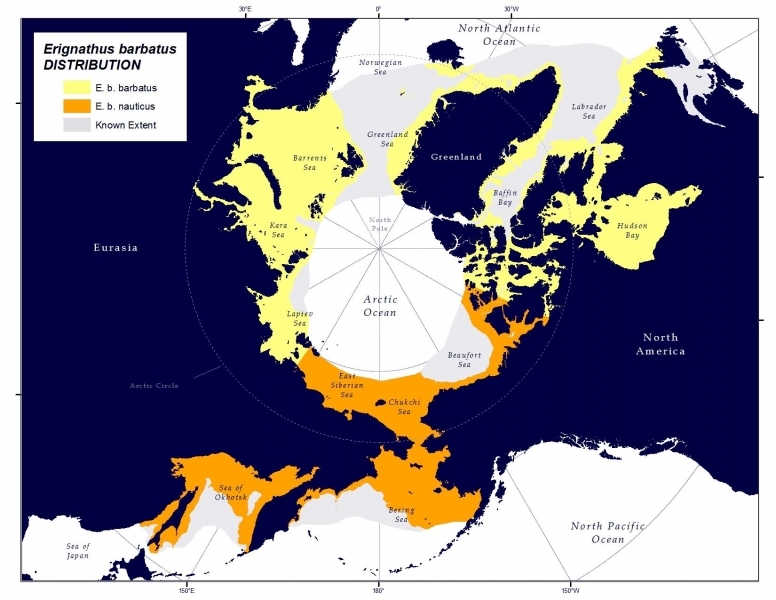 For example, they are known to migrate from the White and Kara Seas to the northern Barents Sea and from the Bering Sea to the Chukchi Sea. 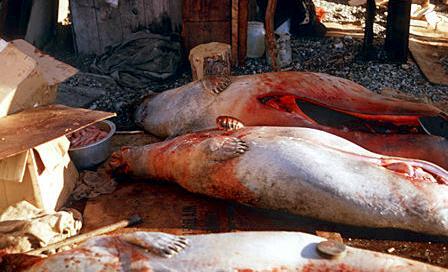 In other areas however, such as the Laptev, Okhotsk and White Seas. 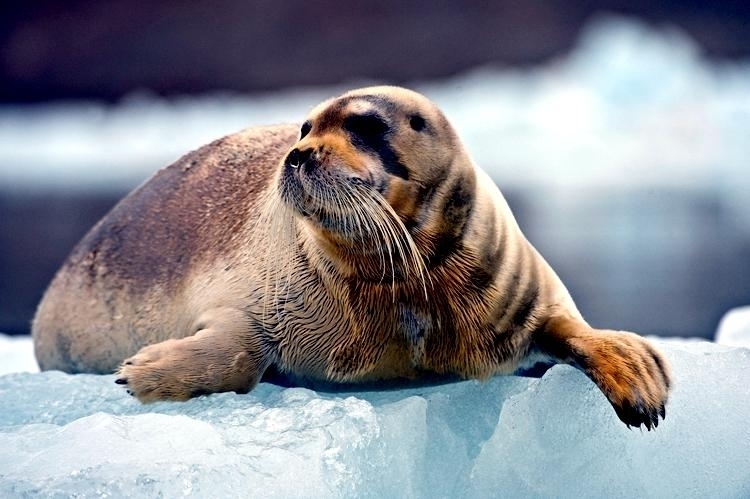 In Alaska, they do not follow the ice but spend the summer in open water on land, generally on gravel beaches. 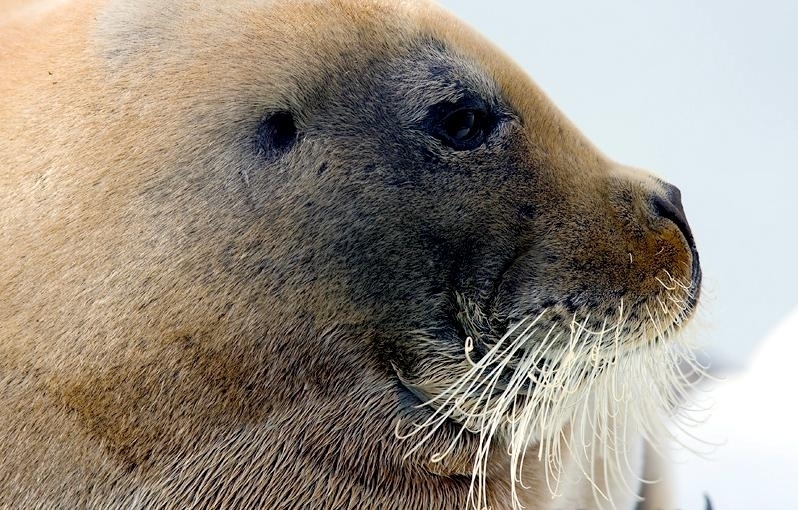 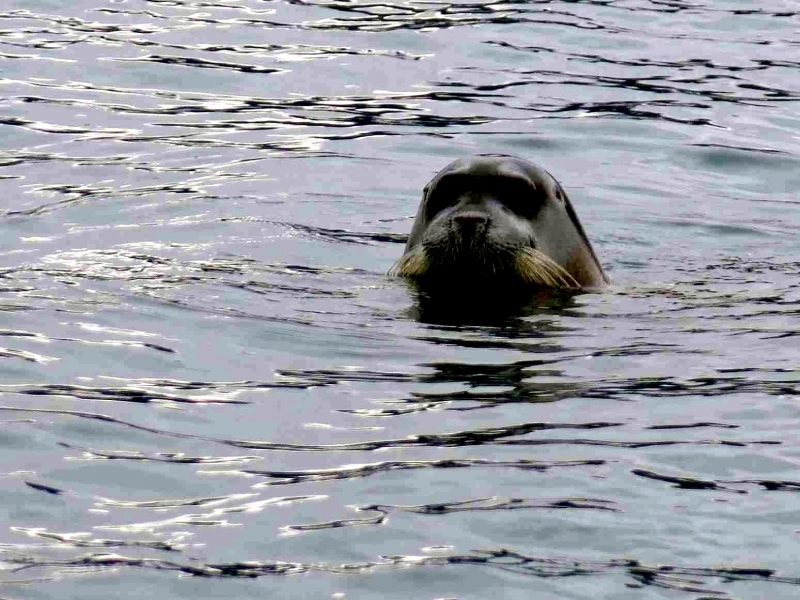 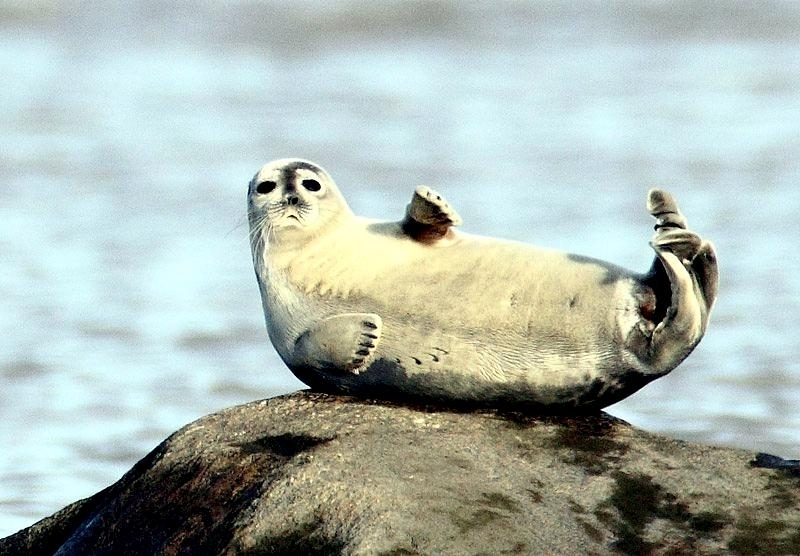 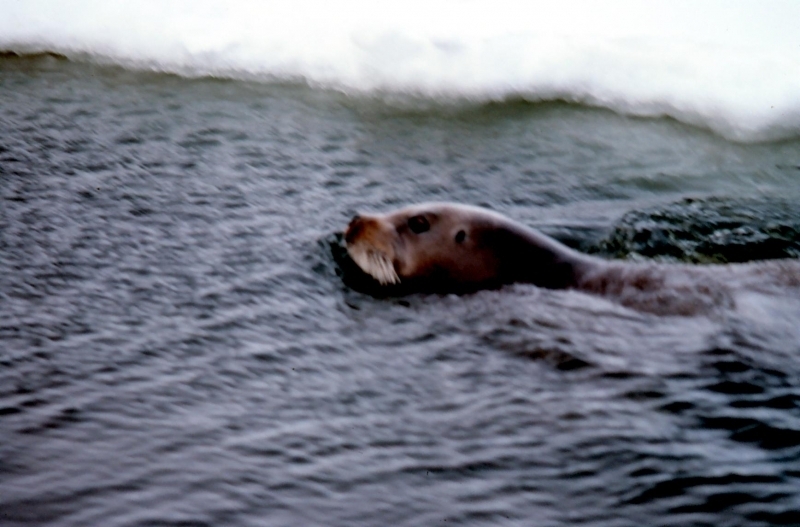 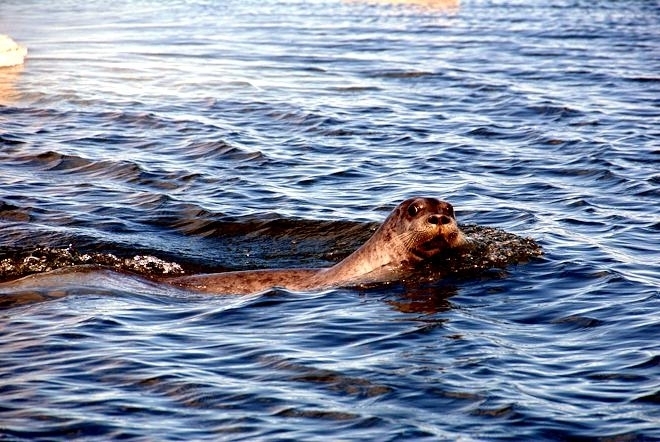 In Canada, Bearded Seals have also been reported in rivers that empty into the Hudson Bay. 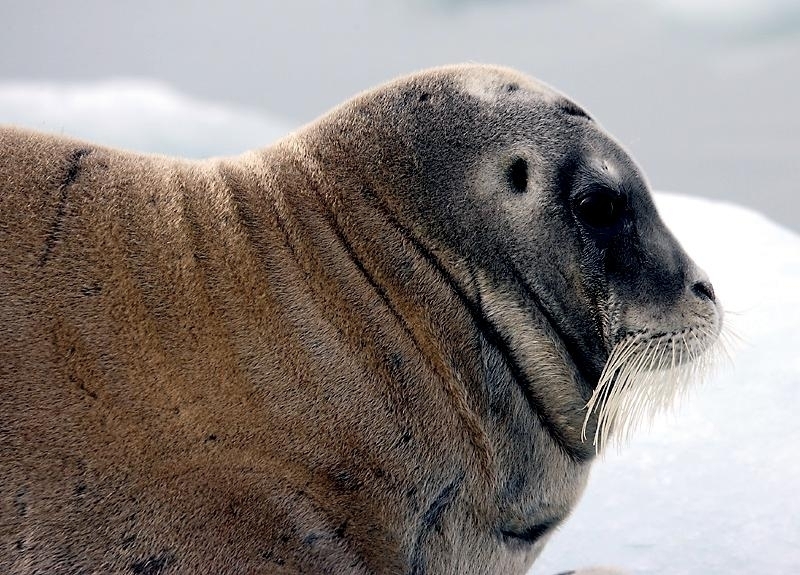 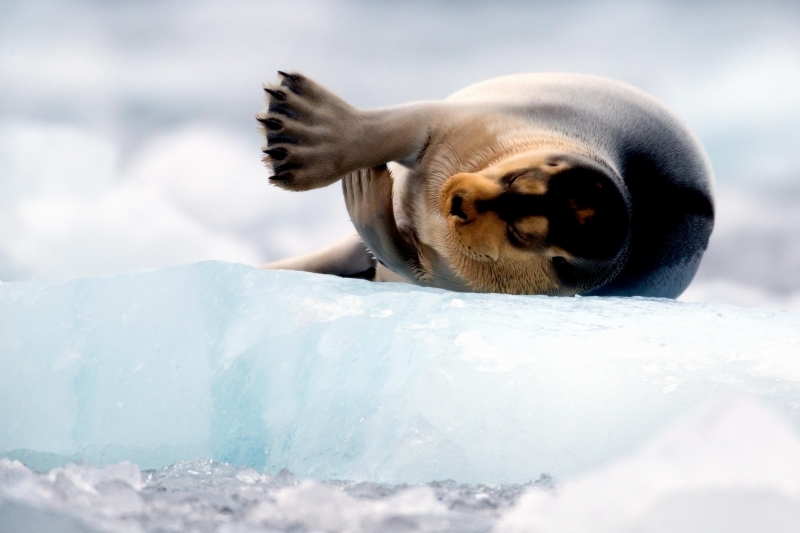 When hauled out on an ice floe, Bearded Seals are seen at the edge of the floe pointing their head downwind toward the water so that they can move rapidly into the water as a protection against predators. 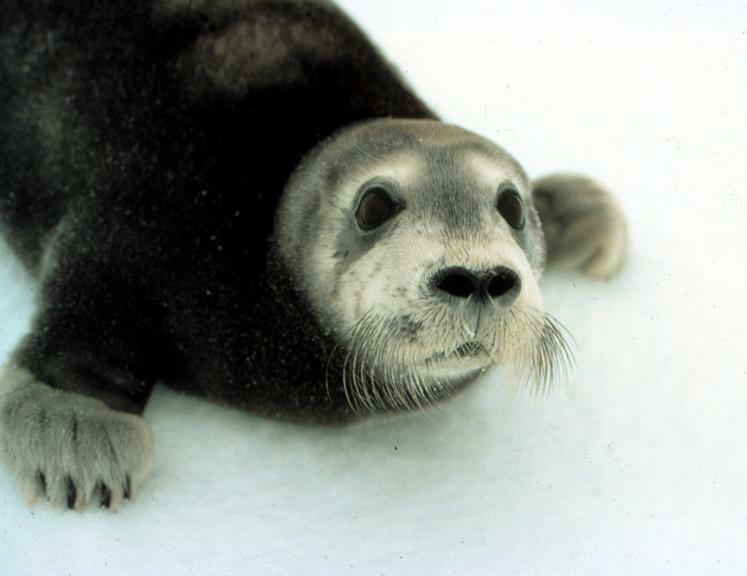 Females reach sexual maturity at 3-8 years, males at 6-7 years. 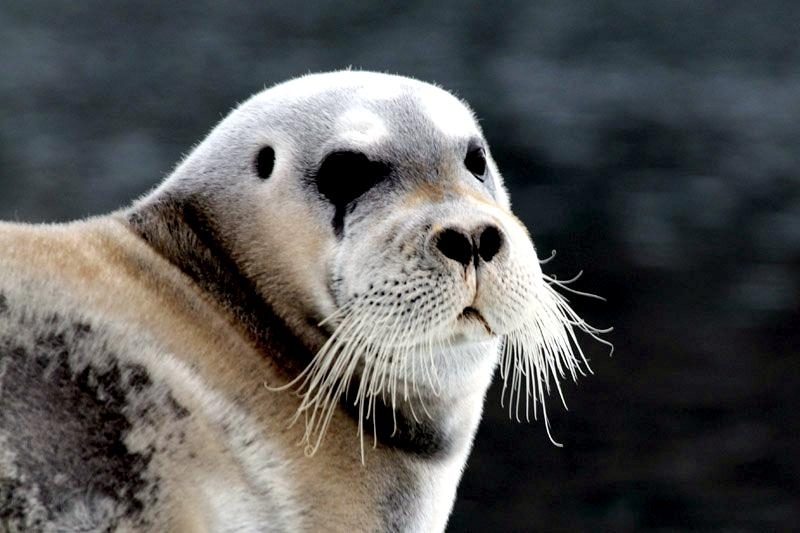 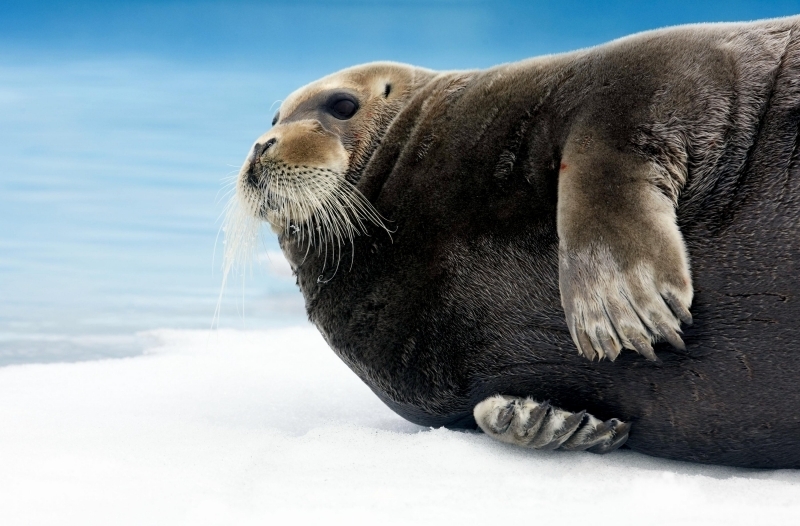 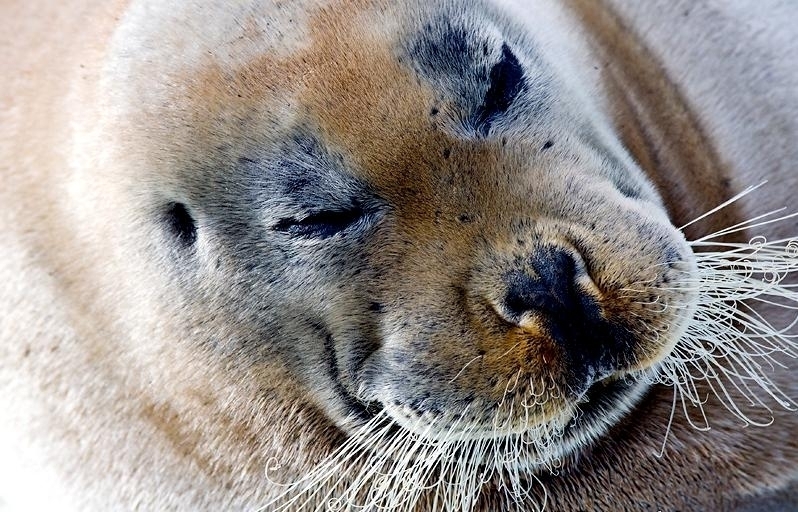 Few Bearded Seals live longer than 25 years. 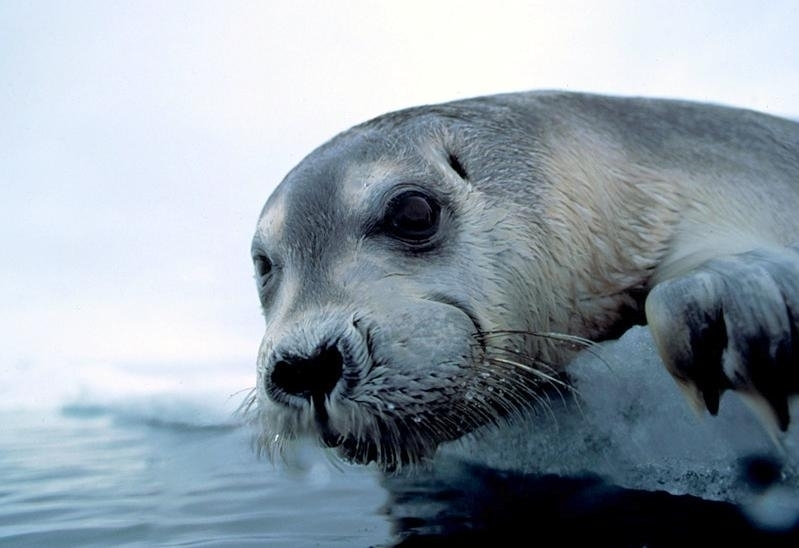 Most pups are born from mid-March to early May, depending on the region. 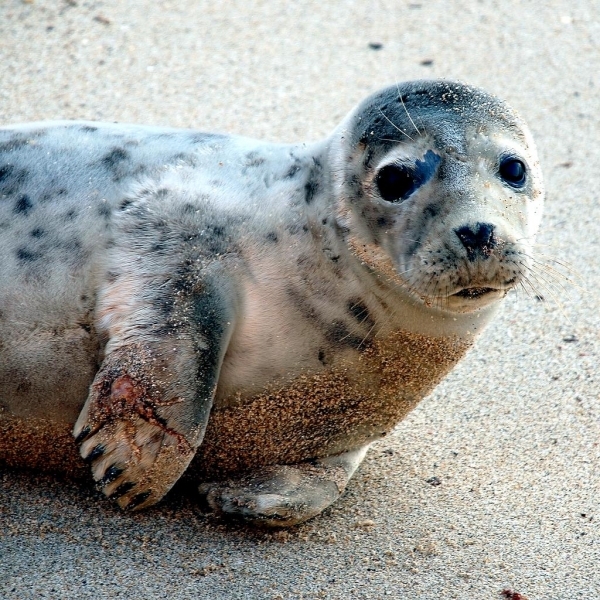 At birth, pups average 1.3 meters in length and 34 kilograms in weight and are born with a grayish-brown coat with light patches on the face, head and back. 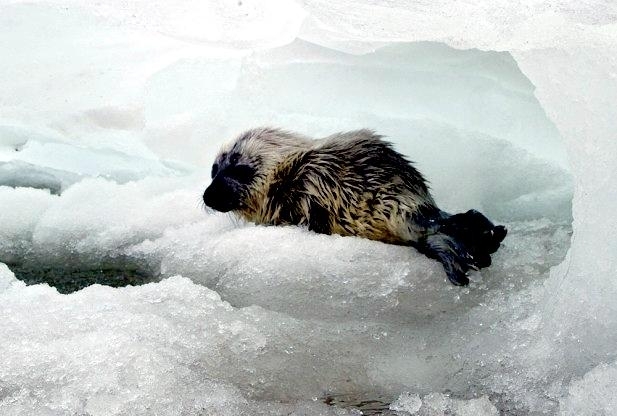 Bearded Seal pups are able to swim almost immediately and have been observed diving as deep as 75 meters for 5 minutes at less than one week old. 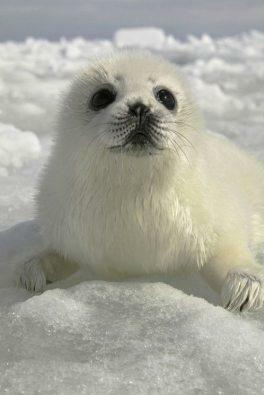 Pups are nursed for about 18-24 days and gain weight quickly. 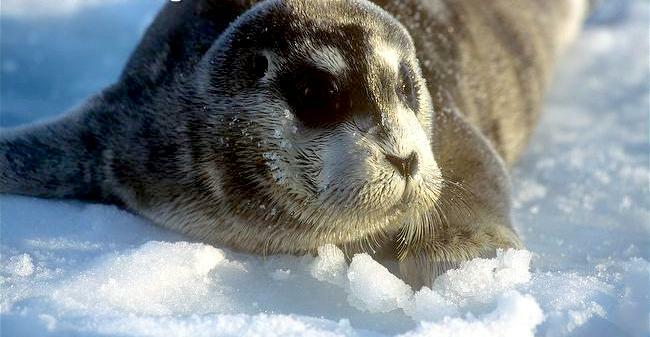 They molt into their adult coat at the time they’re weaned. 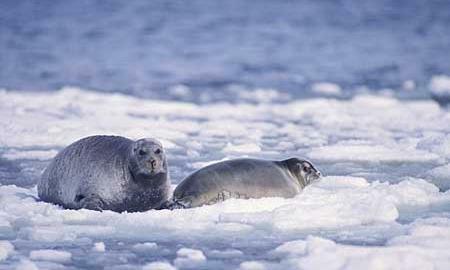 It is believed that the females begin mating again around the time of weaning. 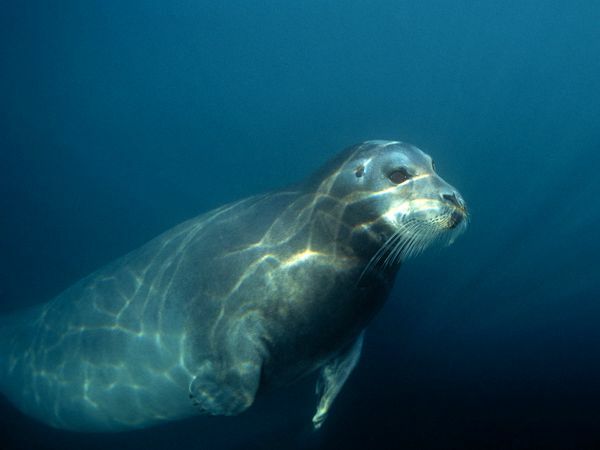 Adult males have a loud underwater call to signal mating readiness and to defend his territory.